Sometimes we are so focused on the future that we neglect the day in which we are living. Let us focus on this very moment and make it the best it can be! What are you doing TODAY to focus on THIS 24 hours? 1. Change your affirmations from future to present tense. Change “I will be five pounds lighter in June” to “I choose healthy ways to nourish myself.” By stating our goals, visions, and beliefs in the present tense, we give them immediate power to happen now. 2. Gently redirect your mind back to the present whenever your thoughts stray. 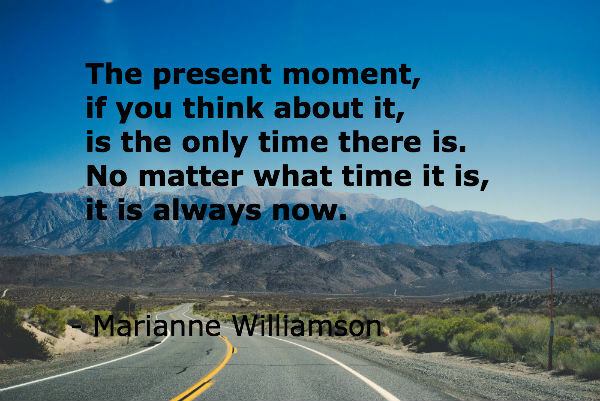 Being in the present is a gradual process. Forcing, punishing, and feeling bad about yourself will disempower you. 3. Live your life with joy. If you are presently content, you have fewer reasons to chase illusions. 4. Open up all of your senses and experience the moment. What do you see, hear, feel, smell, taste, and know on the deepest level about this moment? These thoughts can help ground you in the present. 5. Realize that time is never wasted; it’s only spent. 6. Celebrate the passing of time by enjoying each season. 7. Deliberately place your focus on present action rather than past regrets or future worries. 8. Keep your fear in proper perspective. Fear is a tool for survival, but it shouldn’t be leading a filibuster in your head! Allow other emotions to have airtime. 9. Look at the big picture. Often we get caught up in the details and our perspectives become skewed. Take a step back – take three steps back. Expand the picture as far as your mind can conceive.